What's Checked In An MOT? ATS Euromaster are running a campaign where customers who purchase 4 or more Michelin car, van or SUV tyres from ATS Euromaster (in-centre or online) between 1st March 2019 and 30th April 2019 will be eligible to claim an AmazonFire. All products must be fitted and all services carried out at the time of purchase, except for purchases made online which must be booked in for fitting or supply at the time of purchase. All Michelin Tyres must have been fitted and invoiced prior to claiming an available prize. Sorry, the service is not available at the moment. These tyres are built to carry a heavier load and have a higher inflation pressure. Runflat tyres are made to carry the weight of the vehicle in the event of pressure loss (puncture). 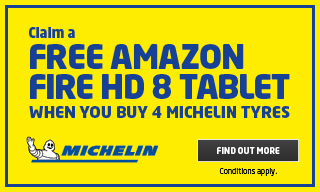 The “Michelin Amazon Fire Promotion” (the “Promotion”) is open to ATS Euromaster’s Retail Customers who are UK residents (excluding Northern Ireland), except ATS Euromaster Ltd’s (the “Promoter”) employees, its agencies or anyone else connected to the creation and administration of this Promotion. This Promotion is open to retail customers only (excludes company vehicle drivers and ATS Euromaster Ltd Business and Account Customers). By participating in this Promotion, all claimants will be deemed to have accepted and agreed to be bound by these terms and conditions and by any other requirements set out in the promotional material. There is a purchase requirement. Claimants must purchase FOUR or more car, van or SUV Michelin tyres from either an ATS Euromaster Service Centre or on the ATS Euromaster website (https://www.atseuromaster.co.uk/consumer) in a single transaction between 1st March 2019 and 30th April 2019 (inclusive) in order to claim a FREE All-New Fire HD 8 Amazon Tablet with Alexa in Black 16GB. All tyres must be fitted and all services must be carried out at time of purchase, except for purchases made online which must be booked in for fitting at the time of purchase. Fitting of online tyre purchase must be completed before a claim can be made. To claim a FREE All-New Fire HD 8 Amazon Tablet with Alexa in Black 16GB (RRP of £79.99) claimants must register their details on an official form completed online at https://www.atsrewards.co.uk/amazonfire/ no later than midnight 31st May 2019. Claims made after this time will not be eligible for the offer. Only one claim can be made per person. Only one claim can be made per vehicle. Claims must be made on an official claim form completed online at https://www.atsrewards.co.uk/amazonfire/ Claimants will be required to enter a valid ATS Euromaster customer sales receipt number or 'document number' to be eligible to make a claim. A copy of the Customer Sales receipt may be required as proof of purchase. Completion of the mandatory fields is necessary to carry out identity checks to validate all claims. Claims will be checked against the name and address on the invoice. Claims may also be made by post by sending a copy of a qualifying Customer Sales Receipt to: MICHELIN Amazon Fire Promotion, Marketing Department, 20 Upper Portland Street, Aston, Birmingham, B6 5TW. Claimants will also need to send a copy of their invoice for their claim to be processed. By participating in the Promotion, claimants accept that ATS Euromaster will submit information entered onto the online claim form or application by post to a third party (the Marketing Lounge Partnership Limited) so that they can validate the information provided, confirm the identity of the claimant and issue the reward in accordance with the Promotion. The All-New Fire HD 8 Amazon Tablet with Alexa in Black 16GB will be sent out to the claimant by 2nd class post within 30 days from validation of the claim. No responsibility can be accepted by the Promoter for All-New Fire HD 8 Amazon Tablet with Alexa in Black 16GB that are damaged or lost during postage. Entry into this Promotion cannot be made other than strictly in accordance with these terms and conditions. Lost, incomplete, invalid, illegible, fraudulent and/or late claims will not be accepted. The Promoter reserves the right to refuse a claim if it believes the claim is fraudulent, not legitimate or not valid. The Promoter’s decision is final and is not open to challenge. This Promotion may not be used in conjunction with any other promotions or offers for the same product or service unless specified below. The All-New Fire HD 8 Amazon Tablet with Alexa in Black 16GB is non-transferable and no cash alternative will be offered. The All-New Fire HD 8 Amazon Tablet with Alexa in Black 16GB are subject to availability. The Promoter reserves the right to substitute it with an alternative reward of equal value in the event that circumstances beyond its control make this unavoidable. The Promoter does not accept any responsibility for any technical or functional issues arising with the All-New Fire HD 8 Amazon Tablet with Alexa in Black 16GB and does not provide any warranty in relation to the product. Any issues should be referred direct to the manufacturer (Amazon). The Promoter reserves the right to withdraw, modify or vary this Promotion as required due to circumstances beyond its control. The Promoter cannot accept liability for any technical issues or any other issues outside of their control that may prevent a Claimant from participating in this Promotion. All information received will become the property of the Promoter. The Promotion and these terms and conditions are subject to English law and the exclusive jurisdiction of the English Courts. This promotion is managed by The Marketing Lounge Partnership, The Cow Shed, Walnut Tree Farm, Lower Stretton, Cheshire WA4 4PG. Telephone 01565 656 975.